For the whole month of May, I had the chance to spend time in a country I had dreamed of traveling for years, Costa Rica. When you picture this paradise, you probably think: perfect waves and beaches, surfers with darkened skin and lightened hair, sloths hanging out in the dense jungle, the incredible cloud forest, and of course, you gotta throw some ziplining and waterfalls into the mix. 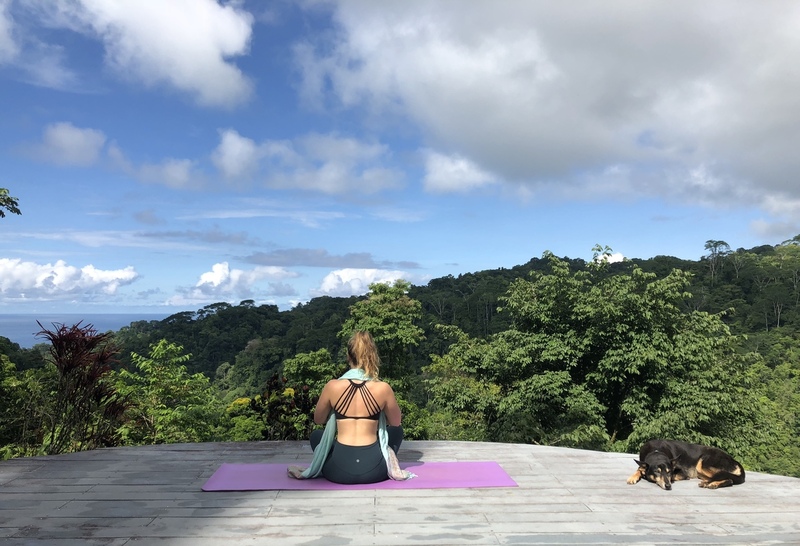 Now, if you’re also into mindfulness or on the spiritual path, you’ll know that Costa Rica is home to some of the most incredible retreat centers in the world. Yoga, plant medicine, health and wellness. This country has it all. Here’s a list of my favorite retreat centers I had the pleasure of visiting in Costa Rica. From the bottom of my heart, I hope someday you get to experience the teachings and beauty of these magical places. Safari Surf School is one of the top surf camps in Costa Rica. Tim and Marsi, founders of the school were super helpful right off the get-go. From providing me with tips about places to visit before my trip, to setting me up with their awesome surf coach, Marlon, when I arrived in Nosara. My lesson was educational and I felt completely safe and in good hands at Playa Guiones! With the minimum wage being quite low in Costa Rica, many locals struggle with finding consistent pay. When looking into how Safari operates, I found out that they only hire and train local surf coaches who are provided with medical insurance, vacation pay and even retirement benefits. You can really sense SSS’s happy family culture as soon as you walk in the door. Whether you’re a beginner with a desire to learn to surf or you’re an experienced surf master just looking to ride, Safari Surf is the place to be. Pachamama is a wonderful place to connect with the medicines of nature. Head to the cacao bar for some energizing drinks or protein balls, meditate in one of their beautiful halls, soak your body in the healing river water or indulge in a delicious meal in the main dining room. There are tons of unique retreats to choose from all year round. Special ceremonies have been held in areas across the property. And if you love it that much, you may want to join the commune or even buy a house on the land! If you’re looking to unplug from technology and learn life-changing, sustainability practices in the midst of the jungle — Rancho Mastatal has got you covered. I couldn’t believe my eyes as my little Honda 4-wheel crawled up the mountain higher. And then even higher. I’m on top of Costa Rica, I thought. Lush, towering rainforest spread its green beauty for miles. I swiveled around sharp corners where the deep crimson red earth met the rocky road. As soon as I arrived a sense of community was projected from everyone I met. Most guests were between 23 and 35. Some were apprentices, working there for months or even staying years. Some were visiting for workshops involving sustainable building, permaculture, fermentation or farming. This place was as eco-friendly as could be! They even had bio-compostable toilets from which they used the methane gas to power the stove! The owner, Tim, has helped build structures, and even schools, within the local community of Mastatal. He plans to continue to share his teachings of sustainable holistic practices with Westerners. Absolutely awesome, if you ask me. As I drove through the hustle and bustle of Alajuela, I was wondering if I was in the right place. The traffic was crazy. It was getting dark. Powerlines hung over the roads as I passed alleyways lined with gates and barbwire protection. Did I take a wrong turn!? When I arrived, a giant gate opened and a sense of calm and peace waved over me. Andrea greeted me with a huge hug and welcomed me into their home. The next morning, she took me around the grassy grounds. It was absolutely stunning, I didn’t feel like I was near a city at all! Andria and her husband, Brian, inherited the land from Andrea’s grandfather who had owned a coffee farm many years ago. So? They decided to work closely with their friend who is an architect. He then came up with a plan to build gorgeous dome structures. Spread across the land, there are ceremony domes, yoga domes, a kitchen dome, an office dome, and even a bathroom dome! Only a ten-minute drive from the San Jose Airport, Esfera Espacio Holistico is the perfect place to come practice or sit in ceremony. Again, I’m amazed at Costa Rica’s gorgeous scenery as I drive around giant canyons, over narrow bridges and above sun-sparkled rivers. Not even an hours drive west of the country’s capital city, San Jose, and only an hour to the Pacific beaches, lives AmaTierra Yoga Retreat & Wellness Center. This is a sanctuary where you can escape high up into the mountains to focus on your health and wellbeing. You’re free to relax by the pool, participate in hatha yoga or enjoy a relaxing massage in the spa. Jill is a registered clinical herbalist and has 30 years of experience working with Chinese medicine and western herbal medicine. Her husband, Bob will be sure to let you in on all of the activities there are to do in the area, while cracking a few funny jokes, of course. As soon as you enter the small mountainside center, Nada Brahma, they take away all your digital devices and your watch so you have no sense of time. There’s no schedule. There are no planned activities. The meal times can be random and the participants never know when they will be sitting with plant medicine — or even which kind of plant medicine for that matter. As a participant, you work with Kambo, Ayahuasca and Huachuma over the course of the retreat. There’s a sweat lodge on the land and sometimes, they hike up to different spaces around the mountains to do ceremonies. Oh, and you won’t be getting sick of the view while you practice yoga amidst the butterflies. Nada Brahma sleeps only nine beds so you are with a small, intimate group for the full week you are there. There’s no doubt you will be walking away from this retreat enlightened, full of wisdom and with a handful of new friends. 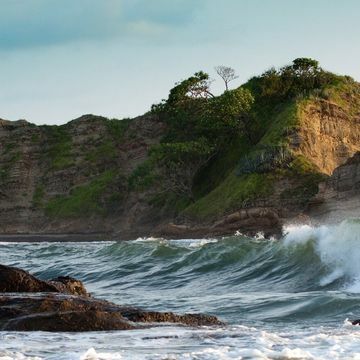 The cute town of Playa Dominical is home to some awesome waves and totally has a backpacker vibe to it! Dominical Waverider is situated right near the beach and welcomes beginners, intermediate and advanced surfers. And surf isn’t the only thing Waveride offers. Kayak through mangrove swamps, zip-line the canopies, paddle board the ocean or visit the many waterfalls in the area. Jeanine, the main organizer at Waverider will be sure to hook you up with a packed adventure. This surf school can adjust to your needs and wants accordingly. You can walk-in or come with a group. Choose to practice yoga or relax on the sandy beach. Whether you’re backpacking on a low budget or want to rent a house with the family, Waverider makes it easy to find the perfect surf package for you! I had plans to visit Eden Retreat Center as I am beyond passionate about holistic health. This plan fell through when I slid my rental car into the ditch (that’s another story for another day!) and couldn’t make the drive. I got to know Dr. Randi afterward and felt the need to share her passion, helping people heal. Each participant’s stay is completely unique when they stay at Eden Retreat Center, just outside of the city of Jaco. Dr. Randi uses a variety of techniques such as acupuncture, ozone therapy, nutritional assessments, light and heat therapy and many more. She also includes activities like qigong, yoga, tai chi, and meditation. If you are on a self-healing journey, your meals are completely personalized. The food you eat is packed with nutrients which Dr. Randi recommends for specific diseases or imbalances. Eden takes an integrative and safe medical approach to help people regain their health and happiness back, all amidst a beautiful setting which overlooks the city, jungle, beach and ocean. Iguana Lodge is situated in the beautiful world-renowned area which is the Osa Peninsula. I heard the massive waves crashing into the shore as I relax on my comfy bed, exhausted from the fun tennis practice I attended with other guests, local neighbors and business owners. It was such a blast! In the morning, the yoga pavilion brought me a complete sense of calm and groundedness. No wonder they rent this space out to teachers to host amazing retreats! Before I left the center (and to really wake up), I swam lengths in the refreshing salt water pool, surrounded by lush, rainforest greenery. Nature, nature, nature. Connecting. Relaxing. Indulging. This place was just what my body and mind needed. Just down the road from Iguana lives Blue Osa Yoga Retreat and Spa. A beautiful green paradise where yogis and yoginis come from afar to attend yoga retreats and yoga teacher trainings. The general manager, Alex, happily took me on the grand tour of Blue Osa, showing me the facilities, gardens, pool, hang out spots, yoga studio and beachfront. I couldn’t believe how peaceful this space felt. Plus, whoever does the gardening are some serious superstars! 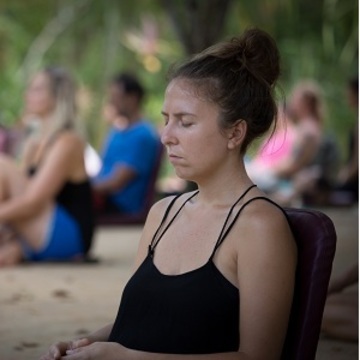 Blue Osa is the perfect place to come, disconnect and focus on your practice. I did NOT want to leave. It’s funny how these places do that. My time spent at Luna Lodge was short, yet so powerful. The Osa Peninsula is one of the most biodiverse areas in the world. Driving to Luna was absolutely magical… and also an adventure! Be sure to have 4 wheel drive as the road can be rough. Trust me though, the trek is worth it. Luna Lodge is surrounded by 360 degrees of tropical rainforest. Shimmery green-skinned hummingbirds drink nectar from the abundance of flowers, blue morphos flutter and float around the rancho and birds welcome you with song as soon as you arrive. The staff at Luna would agree that when you come to the lodge, nature does the healing for you. I stayed in a gorgeous bungalow overlooking the jungle which met the ocean. This peaceful setting, combined with amazing yoga classes, delicious, nutritious food, an educational night tour and the friendliest staff who never stop smiling — made for a great experience, and I was only there one night. A love for conservation is what fuels the Luna Lodge staff, who are really more like family. Lana, the owner and founder came to Costa Rica on a bus with around 15 friends, over 35 years ago, and has dedicated her life to sharing the power of nature with her guests. Lana’s strong desire for sustainability and conservation is going to change the world.